I have been serving as the Rhetoric Consultant on the TATIL test since 2014, where one of my main responsibilities was to analyze the Framework in order to prepare the board to write outcomes and performance indicators. In this post, I will be giving a brief overview as to how I went about that process of understanding the Dispositions. In order to be able to test for the Dispositions, or what the Framework calls the “affective, attitudinal, or valuing dimension of learning,” we needed to determine what kinds of latent traits sat beneath the surface-level descriptions of these Dispositions within the Framework. Studying the Framework, I was initially confused about the distinction between Dispositions and Knowledge Practices because many dispositions appeared to be bound-up with an understanding of core information literacy concepts. For example, in Information Has Value, the Framework says that competent students will “value the skills, time, and effort needed to produce knowledge.” The problem is that in order to value the time and effort required to create knowledge, students must first have learned what is involved in creating these kinds of texts; so, unless students are explicitly taught the multiple stages of forming research questions, collecting data, analyzing, and then synthesizing the information into a cohesive text, how can they have developed an attitude that values the rigor of this process? Thus, an important question emerged: How do we isolate the affective trait from the knowledge implied in the Dispositions? Coming from the field of Rhetoric and Composition and having studied linguistics, I performed structuralist analysis on the Framework dispositions, where my goal was to find the “deep structures,” or underlying similarities, amongst phenomena that appear different on the surface. Using this approach, I did a content analysis of the thirty-eight dispositions within the framework in order to map them back to a small set of foundational, and purely affective traits. 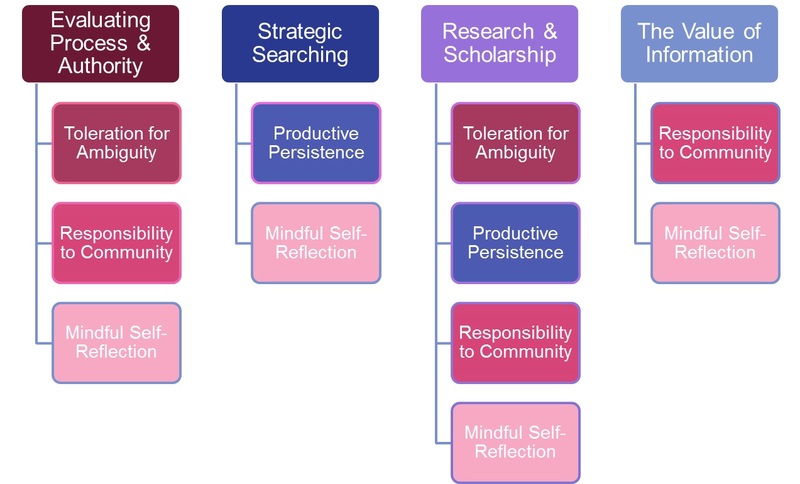 In short, the purpose was to unbind these affective traits from the framework dispositions that were conflating “attitudes” with discipline-specific information literacy skills. This structuralist approach turns out to be a good fit for assessing dispositions, since in order to test for dispositions, you must define the surface-level behavior (actual thing the student does), as well as the underlying, latent and hidden (thus structural) attitude that would create a tendency towards a particular practice. The Framework, then, gave us the content that helped us to determine those latent traits. While these are from different frames, I found commonality amongst them. From this, I then determined that the underlying trait beneath these practices which produces the commonality – the affective trait—was toleration for ambiguity. I also began to notice that some dispositions even contained multiple affective traits within them. For example, the last item on the list mentions persistence, adaptability, flexibility, and ambiguity. Thus, one disposition potentially engages multiple latent traits. As both a librarian and English instructor, I have found the process of unpacking the Framework quite rewarding. In the library and composition classrooms I have been teaching ostensible skills but also trying to cultivate in students a scholarly temperament, so I find the Framework to be an excellent step forward. I feel like we are finally defining information literacy as a discipline by acknowledging that our practices are tied to a deeper, shared temperament that directly informs our practices. In English Composition, we often speak of students who have a particular temperament for literary or rhetorical analysis, which compels English instructors to consider how to teach those affective traits alongside surface-level skills. Now, as academic librarians, we too are starting to identify information literacy dispositions as a first step toward cultivating those traits among our students. For more information about structural genre analysis, read Genre Analysis: English in Academic and Research Settings by John M. Swales. For more information about assessing dispositions as latent characteristics, read Instrument Development in the Affective Domain: School and Corporate Applications by McCoach, Gable, and Madura. For more information about our definitions of the IL Dispositions and how we are assessing them, view the slides from the LOEX Fall Focus.